Meet curators, conservators, archivists and other specialists and learn how they care for objects in the museum’s collection. 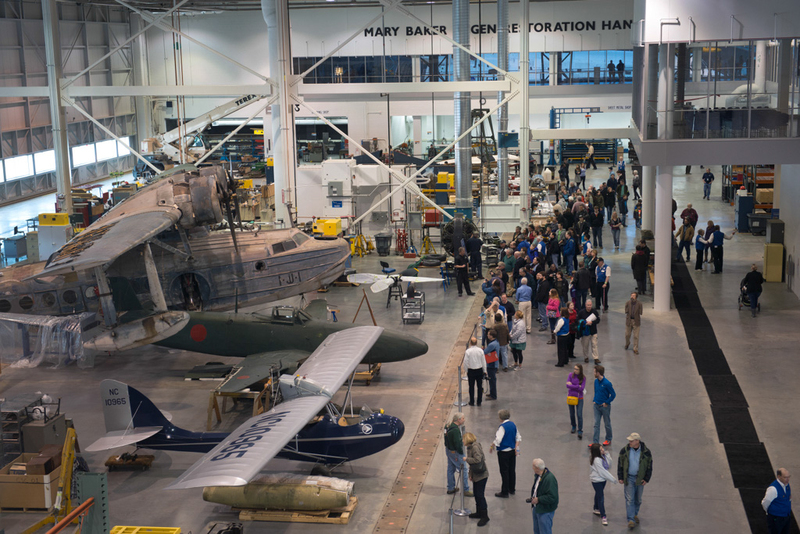 Tour the Mary Baker Engen Restoration Hangar and see the museum’s current projects such as the Martin B-26B-25-MA Marauder “Flak-Bait” and the Apollo Telescope Mount. Learn how aircraft are suspended for display in the Boeing Aviation Hangar (requires timed tickets; all other activities will be available to all visitors). See how the museum’s most fragile artifacts are cared for and stored. Get tips for photographing objects in the museum from a staff photographer. Admission to the museum and Open House is free; parking is $15. The Open House is made possible through the support of FBR. Learn more about this event on the museum’s website. Since it opened in conjunction with the nation’s Centennial of Flight in 2003, the Udvar-Hazy Center has expanded in all areas, most notably because of a new wing devoted to collections care. The new section contains several state-of-the-art storage facilities for entire collections, such as spacesuits and works of art, as well as a conservation lab and processing units, and the Mary Baker Engen Restoration Hangar, a 48,000-square-foot facility large enough to house seven aircraft at the same time. The museum’s archival research facility, containing millions of documents, photographs and film and video collections, is also at the center. The number of major artifacts on display, arranged in thematic sections following a “displayed storage” design scheme, has risen from 348 in 2003 to 3,250 today. The National Air and Space Museum building on the National Mall in Washington, D.C., is located at Sixth Street and Independence Avenue S.W. The museum’s Steven F. Udvar-Hazy Center is located in Chantilly, Va., near Washington Dulles International Airport. Attendance at both buildings combined was 8 million in 2014, making it the most visited museum in America. The museum’s research, collections, exhibitions and programs focus on aeronautical history, space history and planetary studies. Both buildings are open from 10 a.m. until 5:30 p.m. every day (closed Dec. 25).